Researchers at KAUST are developing a novel molybdenum-coated catalyst capable of splitting water in acidic electrolytes in an efficient manner. This new catalyst could help with efficient production of hydrogen. Hydrogen gets converted into water and heat, when burned, in order to produce a completely clean power source. Therefore, in the search for greener power, there is indeed an urgent requirement for an efficient and sustainable means of producing it. 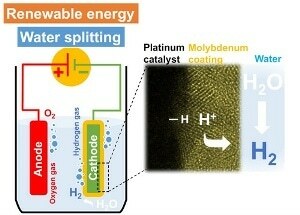 One way refers to the splitting of water using a process called photocatalytic hydrogen evolution. In this process, water molecules are split into oxygen and hydrogen using just sunlight in order to provide the required energy. Thus, in this sense, hydrogen performs as a means of storing solar energy. Scientists are currently seeking ways to bring about improvements in this water-splitting reaction by producing an optimal catalyst. Although a variety of materials have been tried, they are generally adversely affected by the oxygen that is also produced alongside the hydrogen during the process. It is possible for both the gaseous products to effortlessly recombine back to water because of the reverse water-forming reactions, hampering the production of hydrogen. Dr. Angel Garcia-Esparza and Dr. Tatsuya Shinagawa, two former KAUST Ph.D. students as key researchers supervised by Associate Professor of Chemical Science Kazuhiro Takanabe, partnered with colleagues from the Catalysis Center and other specialists in the University to develop a hydrogen-evolution reaction catalyst that both selectively avoids the water-reforming reaction and is acid-tolerant. The development of acid-tolerant catalysts is an important challenge because most materials are not stable and quickly degrade in the acidic conditions that are favorable for hydrogen generation. The researchers took the time to prove the optimal pH level between 1.1 and 4.9 since the acidity of the solution was vital for the stability of the material. This was followed by electro-coating molybdenum onto a standard platinum electrode catalyst in a mildly acidic solution. By comparing the performance of the photocatalyst without and with the molybdenum coating, the researchers demonstrated that the rate of hydrogen production ultimately plateaued after 10 hours of working under illumination by ultraviolet light without molybdenum. However, this fall in performance was prevented by the introduction of molybdenum. The team assumed that this is because the molybdenum behaves as a gas membrane in order to prevent oxygen from reaching the platinum and hindering its catalytic performance. The main challenge for most catalysts is the long-term stability of the materials. So it is an important step to have an acid-tolerant material capable of preventing the water-forming back reaction that slows down water splitting. Nevertheless, we are still far from a commercial device and more work needs to be done.